It’s one of the most important documents you’ve never heard of, but the i94 form is actually one of the easiest to get your hands on and being aware of it is worth its weight in gold for those who are temporarily in the United States. The Arrival and Departure Record is the I-94, in either paper or electronic format, issued by a Customs and Border Protection (CBP) Officer to foreign visitors entering the United States. 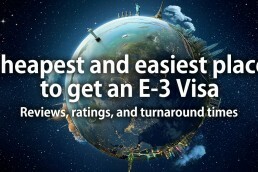 In both circumstances, an electronic I-94 or paper I-94, the visitor must exit the U.S. on or before that date stamped on the form or in the passport. The reason you should care is that second sentence above. This document is more important than your visa when it comes to how long you can stay in the U.S. Your visa is an entry document (meaning it allows you entry into the U.S.) but once you’re in, it really doesn’t mean much. The i-94, on the other hand, is the document that defines how long you can legally stay in the country. The date that is attached to this document is the date you have to leave the country before. Every time you enter the country, you will receive a new i94 with potentially a new date, so it’s important to check each and every time you re-enter. How do I check my i94 status? “Get this traveler’s history” has some extra information about your recent exits and entries, too! Check ALL of these, and make sure everything is correct. My friends at the Lightman Law Firm LLC have written an article about the i94 and why it’s important, too. Most importantly they’ve included an extra section on what to do if yours has an error, so be sure to head over to their site and find out. Do not schedule a flight to leave a day before your “Admit Until Date”. At worst, you should be leaving a week before this date, because things can always go wrong. If your flight is delayed and you stay beyond the date of your i-94, you’re going to be in big strife, so be sure to prepare in advance! Is your passport expiring while you’re overseas? I’ve got you covered! Where to get a visa for the U.S. – Which country is best?